Navajo Fabrics is recognized as a worldwide leader in camouflage and solid color fabrics for the various branches of the U.S. military, as well as allied forces, with over 40 years of experience. Our technical know-how allows us to design fabrics for unique end uses. Navajo also produces high performance fabrics tailored for unique products and individual customer needs. Our market position allows us the ability for quick execution of customer orders in a comprehensive range of fabrics for specification driven global markets. Navajo Fabrics is a diversified manufacturer of military uniform, police, tactical and equipage fabrics. We are a leading supplier of fabric for the military, law enforcement, public safety, medical, and security markets. 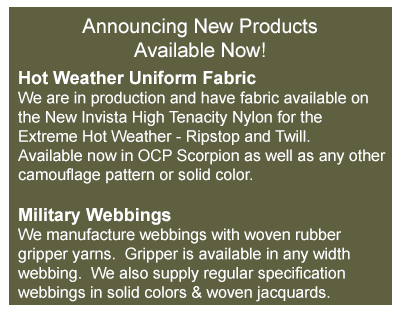 Our business focus is to produce fabrics for OCIE (Organizational Clothing Individual Equipment) as well as unique solid colors and camouflage patterns for specialty missions and specific environments. We have partnered with fiber producers, mills, dyers and printers to be able to provide functional and durable quality products with high performance characteristics. We have also partnered with some US government prime contractors in order to be able to offer made up uniforms and equipage. Our products are Berry compliant and made in the USA; we also offer imported fabrics when the need arises. To our many customers that use and depend upon our products, the Navajo name has become synonymous with quality, dependability and service. Navajo is dedicated to producing outstanding quality products to satisfy our individual customer's requirements in worldwide markets.